Intro: A member of the custard apple family. It’s characterised by a strong tangy flavour. Superb dessert fruit. 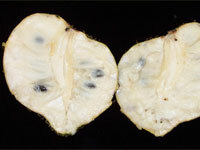 Soursop leaves are regarded as having sedative properties. In the Netherlands, the leaves are put into pillowslips or strewn on the bed to promote a good night’s sleep. History: Originated in the West Indies and the Americas. Weight/size: Typically ranges from 10-30cm long and up to 15cm in width, and the weigh between 1kg – 6kg. Colour: Green soft spiky skin with white flesh. Taste: The taste, as the name applies, is sweet acid. Buying/storage: The tips break off easily when the fruit is fully ripe. The skin is dark-green in the immature fruit, becoming slightly yellowish-green before the mature fruit becomes soft to the touch. Sounds hollow on tapping when fully ripe. base when mixed with other fruits for fruit roll-ups. Immature soursops can be cooked as vegetables or used in soup. Variety: Cuban Fibreless and other common selections.